Many of those reports  have just been made available to the public via the pro-transparency site WikiLeaks , which has posted 6,780 CRS reports. The folks at WikiLeaks won't say how they got the reports: "As for getting, everyone wants to know which member of Congress or their staff is our source. Naturally we can't talk about that," a WikiLeaks staffer told us in an e-mail. CRS can't offer up the reports because they are required by statute to make its reports available only to members of Congress. 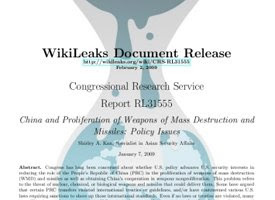 According to an April 2007 memo  (PDF) from CRS director Daniel Mulhollan, CRS lacks the "authority to make its products available to anyone other than the Congress of the United States." "Needless to say, I don't find the arguments persuasive," said Stephen Aftergood of the Federation of American Scientists. "The CRS' sister congressional organization, the Government Accountability Office , publishes new reports online each day without any detrimental effect. But the decision to publish is for Congress to make, not CRS." Aftergood's organization, FAS, has its own archive  of CRS reports dealing with national security, intelligence and foreign relations. Others have published the reports too: The University of North Texas Libraries has an extensive CRS collection  as does the Thurgood Marshall Law Library at the University of Maryland School of Law. And OpenCRS , a project of the Center for Democracy and Technology, has a directory to CRS collections around the country. One of the few natural outlets that doesn't offer CRS reports: the U.S. government. Just in time for an early Valentine's Day gift for nerdy wonks all around! !